Influenced by their molecular properties, the solubility of nutrients determines how well they will be absorbed by the body. Whether a vitamin is soluble (dissolvable) in water or in lipids influences where it can be utilized and whether any excess will be excreted or stored. Water-soluble B-complex vitamins and antioxidant vitamin C are quickly and easily utilized; any excess intake is eliminated so daily replenishment is required. 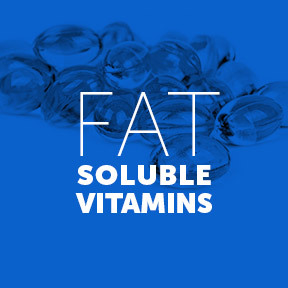 Not surprisingly, fat-soluble vitamins A, D, E and K require some dietary fat in order to be absorbed and metabolized. Excess intake of these nutrients is stored in the liver and the body’s fatty tissues until needed. Dietary fats are also required for the conversion of carotene to vitamin A, for mineral absorption, and for numerous biological processes. Vitamins A, D and K cooperate synergistically, and also work in tandem with important essential minerals like magnesium, calcium and zinc. Nutrient deficiencies are generally the result of dietary inadequacy, impaired absorption, increased requirement, or increased excretion. While a well-balanced diet containing a wide variety of nutrient dense whole foods can provide sufficient amounts of vitamins and minerals, nutrient deficiencies are incredibly common. Unlike vitamins A, E and K that have multiple dietary sources, very few foods naturally contain vitamin D. As food sources are limited, a deficiency can occur when dietary intake is insufficient over a period of time. Since vitamin D is synthesized through skin exposure to ultraviolet radiation from sunlight, restricting sunlight exposure can also create a deficiency of this nutrient. Additionally, low serum levels of vitamin D can result from inadequate digestive absorption, or the inability of the liver and kidneys to complete the synthesis of vitamin D from ultraviolet light. Also known as retinol, antioxidant vitamin A is critical for the maintenance of normal vision, as well as the growth and specialization of virtually all bodily cells. Vitamin A has important roles in embryonic development, normal immune functions, red blood cell production and free radical scavenging. Naturally present in foods such as organ meats, salmon, dairy products and colorful fruits and vegetables, vitamin A is actually a group of nutritional organic compounds that include retinol, retinoic acid, and provitamin A carotenoids, most notably beta-carotene. Although it is best known for the ability to support eye health, vitamin A also helps to relieve inflammation and supports bone, immune, skin and tissue health. All vitamin D, whether obtained through sunlight exposure, diet or supplementation, is biologically inert. To become biologically active it and must go through conversion, first in the liver, then in the kidneys. As optimizing vitamin D levels is important to disease prevention and long term health maintenance, one must expose large amounts of skin to the proper amount of sunlight, or supplement with vitamin D3, a highly potent, quickly converted bioactive form. Actually considered a prohormone, vitamin D has the potential to provide numerous health benefits when adequate levels are maintained. Among its many functions are the facilitation of calcium, phosphate and magnesium absorption, cell growth modulation, and inflammation reduction, as well as immune and neuromuscular support. Vitamin D may play a role in protecting against certain cancers, heart disease, diabetes, stroke, autoimmune diseases and depression. As many individuals either avoid sun exposure or block ultraviolet rays with sunscreen, supplementation with vitamin D3 may be a wise choice for those who with low serum levels of vitamin D.
Required for the proper function of many organs, enzymatic activities and neurological processes, antioxidant vitamin E fights free radicals, helps reduce inflammation, and works to balance hormones naturally. Found in seeds, nuts, whole grains and some fruits and vegetables, vitamin E helps boost immunity and supports blood vessel health. Although more studies are needed, vitamin E may support cardiovascular health by helping to prevent platelet clumping and plaque buildup in blood vessels. Through its ability to fight the inflammation and oxidation linked to numerous health conditions, vitamin E may aid in the prevention of cataracts, arthritis and some cancers. Well known for its crucial role in proper blood clotting, vitamin K is also essential for building strong bones and preventing heart disease. Of the three types of vitamin K, K1, K2 and K3, natural vitamin K2 is synthesized in the digestive tract and is the form most often recommended for supplementation. Viewed as an important nutritional intervention for improved bone density, vitamin K2 aids the deposit of calcium and other important minerals into the bone matrix. Additionally, published research has indicated that optimum intake of vitamin K plays an important role in longevity. By aiding calcium placement in the bones, vitamin K helps to keep calcium deposits out of arteries and blood vessels, thereby preventing arterial calcification, or atherosclerosis, that can lead to heart attacks and stroke. Primarily present in leafy vegetables, vitamin K can be found in fermented foods and animal products, such as meat and dairy. It can be nutritionally challenging to get the macro- and micro-nutrients the body requires, particularly when one is elderly or dieting, or has illnesses, allergies, or dietary restrictions that require the elimination of entire food groups. The result of sub-optimal intake of nutrients is a sub-optimal state of health. RDA’s, known also as Daily Values (DV), are typically based on a 2,000 calorie per day diet. With diet alone, the average American will fail to meet RDA’s for B vitamins, vitamin D, and minerals such as iron, magnesium and zinc. Even those who consciously eat a nutritious diet each day may fall alarmingly short of their RDA’s for maintaining optimal health. Comprehensive Nutritional Panel by Spectracell Laboratories: Micronutrient testing offers an accurate, scientifically proven method of assessing nutritional deficiencies. This test measures 35 nutritional components including vitamins, minerals, antioxidants, and metabolites, as well as amino and fatty acids. Test kit, shipping labels and complimentary post-test consultation with Registered Nurse included. Vitamin A 10,000 IU by Pure Encapsulations®: Largely derived from Norwegian cod liver oil, this product supplies an optimum amount of vitamin A per serving in support of healthy bodily function and maintenance. Gluten and soy free, Non-GMO formulation. Vitamin D 5,000 IU by Douglas Laboratories®: One tablet supplies 5,000 IU of vitamin D3 in support of calcium absorption, bone metabolism, and optimal health. Gluten, wheat, soy, dairy, sugar, yeast and artificial ingredient free, Non-GMO vegetarian formulation. Natural Vitamin E Complex with Mixed Tocopherols by Douglas Laboratories®: One softgel provides 400 IU of pure, natural alpha, beta, gamma and delta tocopherols in support of free radical defense. Gluten and soy free formulation. K2-7 + D3 by Vital Nutrients: This synergistic formulation supports healthy serum calcium levels, healthy bone and calcium metabolism, and vascular elasticity. Gluten, wheat, dairy, soy, egg and sugar free formulation. Can a Healthy Lifestyle Reverse Chronic Low-Grade Inflammation? Posted on July 20, 2017 | Comments Off on Can a Healthy Lifestyle Reverse Chronic Low-Grade Inflammation? As part of the body’s immune response, acute inflammation is the beginning of the biological healing process. A central component of innate immunity, inflammation is a local response to pathogens and injured tissue. Per the British Journal of Nutrition, acute inflammation is “marked by increased blood flow, capillary dilation, leukocyte (white blood cell) infiltration and the localized production of a host of chemical mediators,” all in pursuit of the identification and destruction of toxic agents and the repair of damaged tissue. Generally considered to be a protective mechanism, the trouble begins when anti-inflammatory mediators don’t resolve, and pro-inflammatory pathways don’t switch off. The balance between pro- and anti-inflammatory cytokines plays a critical role in the body’s response to an inflammatory stimulus. Low grade inflammation is defined as a two to four-fold increase in circulating levels of pro-inflammatory and anti-inflammatory cytokines, as well as other markers of immune activity. Chronic inflammation can occur when the body sends an inflammatory response to a perceived threat when a response is unwarranted, or can result from a failure to eliminate the cause of acute inflammation. The association between chronic low-grade systemic inflammation and chronic disease development is well recognized, yet the question as to why the immune system goes awry, signaling attacks on and destruction of its own healthy tissues, remains unclear. Obesity, bacteria; and the western lifestyle, characterized by sedentary habits, sleep deprivation, and a diet rich in industrially refined foods, are considered likely contributors to systemic inflammation. 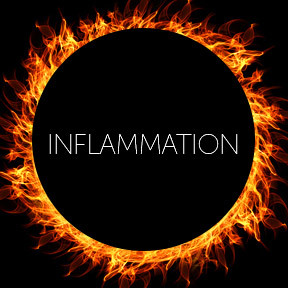 Chronic inflammation can remain silent and symptomless and persist for years until a serious disease presents itself. Elevated unresolved inflammation can affect the body’s organs and tissues, and lead to conditions such as chronic sinusitis, rheumatoid arthritis, heart disease, diabetes, arteriosclerosis, and irritable bowel syndrome, as well as some cancers and Parkinson’s, Alzheimer’s, Crohn’s diseases. The American Heart Association recommends blood tests that measure levels of C-reactive protein (CRP), a marker of inflammation. Elevated levels of CRP are linked to plaque formation and a higher risk of developing coronary artery disease. Scientists have found that obese people have higher levels of white blood cells, and ultimately, persistent inflammation. Studies also show that reducing inflammation through weight loss, along with modifiable dietary and lifestyle factors, may offer a disease-prevention strategy. Certain foods, supplements and nutraceuticals are known to target a range of compounds associated with inflammation. Astaxanthin, omega-3 essential fatty acids, and turmeric may help to slowly reduce or prevent inflammation without the side effects of anti-inflammatory OTC formulations and pharmaceuticals. -Substantial evidence suggests that foods and nutrients, such as those found in a Mediterranean style diet, help to modulate both acute and chronic inflammation. -Foods that help reduce inflammation include fatty fish, berries, leafy greens, nuts, olives and spices, including ginger, rosemary, cinnamon, garlic and turmeric. -Foods that fuel inflammation include fried foods, red and processed meats, sugary foods and refined carbohydrates. -Moderate intensity physical activity can improve weight and cholesterol, enhance cardiac and lung functions, calm stress and reduce inflammation by the release of hormones that decrease production of immune substances. -Sleeping for fewer than six or more than eight hours nightly is associated with higher levels of C-reactive protein. Although sleep requirements vary, as a general rule, aim for the optimal amount of sleep. -Omega-3 essential fatty acids are associated with lower levels of proinflammatory markers. An Ohio State University study showed that daily consumption of omega-3’s reduced acute and chronic inflammation, as well as anxiety in a group of young healthy people. -Astaxanthin, a potent antioxidant and powerful anti-inflammatory, has been shown to cool the fires of the inflammatory process in peer reviewed scientific studies. -Tart cherries’ powerful antioxidant and anti-inflammatory properties have been shown to significantly reduce levels of key inflammatory markers. – B vitamin insufficiency can harm the lining of the blood vessels through increased clotting, oxidative stress, and interactions with white blood cells. Magnesium deficiency is also thought to play a role in chronic inflammation, and those deficient in vitamin A are more likely to have a prolonged inflammatory response. Astaxanthin 4 mg by Pure Encapsulations®: Derived from Hawaiian microalgae cultivated under pristine and highly controlled conditions, this powerful antioxidant naturally supports skin, macula, joint, immune and cardiovascular health. Gluten and soy free, Non-GMO formulation. ProOmega® Lemon 1000 mg by Nordic Naturals: Clinically shown to provide high intensity, therapeutic support with high levels of pure omega-3 fatty acids, this deep-sea fish oil provides support for cardiovascualar, liver, joint, immune, brain and eye health, as well as a healthy natural inflammatory response. Gluten free, no artificial ingredients. Tart Cherry Ultra by Enzymatic Therapy: Tart cherries provide anthocyanins, beneficial antioxidant phytonutrients known to inhibit oxidative damage. Gluten, wheat, soy, dairy, sugar, yeast and artificial ingredient free, vegetarian formulation. Vitamin A 10,000 IU by Douglas Laboratories: One softgel provides 10,000 IU of vitamin A palmitate in support of eye and cellular health, and a healthy immune response. Contains soy and fish oil. Active B-Complex by Integrative Therapeutics: Active B-Complex provides a full complement of bioavailable B vitamins in support of numerous biochemical processes that support good health and bodily function. Gluten, dairy, sugar, yeast and artificial ingredient free, vegetarian formulation. Chelated Magnesium by Douglas Laboratories: One tablet provides 100 mg of elemental magnesium in the form of magnesium amino acid chelate for optimum absorption and assimilation in the body. Comments Off on Can a Healthy Lifestyle Reverse Chronic Low-Grade Inflammation?